After years of working with top grade Australian opal in our jewelry, we have decided to expand our options to include lab created opal rings and jewelry. In recent years top quality natural Australian opal has become harder to obtain and the price has steadily increased to reflect its rarity. We realize that not everyone has the budget for Australian opal jewelry in 14 karat gold so we have decided to offer laboratory created opal as an affordable alternative in our silver and stainless steel rings and wedding ring sets. The lab created opal we are using in our lab opal rings is available in a variety of colors and rivals the fire and vibrant colors of natural opal. Laboratory grown opal has essentially the same optical, physical and chemical properties as natural opal with the exception of water content. 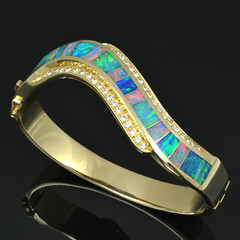 Natural opal is composed of 5 to 15% water and man-made or synthetic opal contains no water. Instead the water is replaced with resin which increases the lab created opal’s strength and durability. We hope that you will be as pleased with the look of this laboratory created opal as we are. 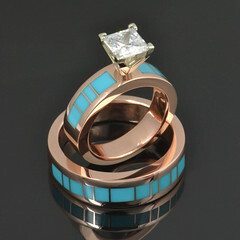 We will be adding more rings with the new lab created opal color choices as soon as possible. Until then, here are a couple of examples of lab opal colors or you can visit our Flickr photo page for more photos. 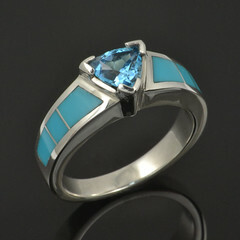 Keep in mind that any of our ring designs can be inlaid with the new lab created opal in the color of your choice. Please visit our websites at www.HilemanSilverJewelry.com or LabOpalJewelry.com for more information or email us with questions at info@HilemanSilverJewelry.com. This entry was posted in Lab Created Opal, New Designs and tagged about lab opal, Australian opal, australian opal jewelry, Hileman jewelry, lab created opal information, lab created opal ring, laboratory grown opal, laboratory grown opal jewelry, man made opal, natural opal, opal information, opal wedding ring, stainless steel rings, sterling silver ring, synthetic opal, synthetic opal ring. Bookmark the permalink. 2012 Wedding Wire Bride’s Choice Winner! !